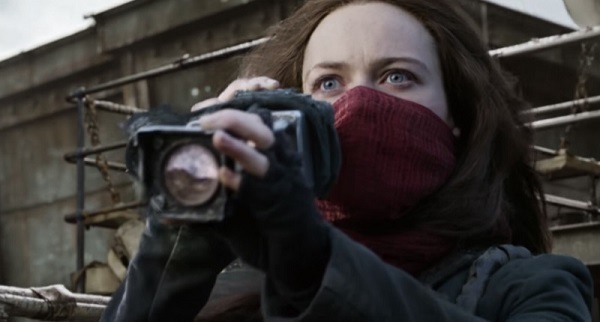 A new trailer for Peter Jackson's steampunk YA movie Mortal Engines is here and it's epic. It aired with the Star Wars: The Last Jedi movie and is now online. The series is about a far distant future where humanity lives on giant rolling cities that prey on one another for resources. The trailer opens with a city rolling precariously on a barren landscape. Hera Hilmar, who plays Hester Shaw the lead female role, uses a telescope to see an even bigger city on the horizon. The city is named "London". It opens a ramp and huge arms to engulf the smaller city as we see images of people walking around on the sprawling landscape above. The movie centers on teen Tom Natsworthy, played by Robert Sheehan, who uncovers a massive conspiracy. The Mortal Engines Quartet is a tetralogy made up of four novels written by the British author Philip Reeve: Mortal Engines (2001), Predator's Gold (2003), Infernal Devices (2005), and A Darkling Plain (2006). It's also been called the "Predator Cities Quartet" or the "Hungry City Chronicles". The series is set in a distant future, known as the Traction Era, in which the Earth is now a wasteland after a devastating conflict, known as the Sixty Minute War. Political nations no longer exist but mobile city-states use giant mechanical jaws to take apart smaller cities. "Old-Tech" from the 21st century is highly prized and a sought-after commodity. Rege-Jean Page, the who played "Chicken George" in Roots, plays Captain Khora. He's an African soldier of the Anti-Traction League, and captain of the gunship Mokele Mbembe. It also stars Colin Salmon, best known for the James Bond films and Arrow, as Chudleigh Pomeroy a member of the Guild of Historians and a key figure in London's future. Official Synopsis: "Thousands of years after civilization was destroyed by a cataclysmic event, humankind has adapted and a new way of living has evolved. Gigantic moving cities now roam the Earth, ruthlessly preying upon smaller traction towns. Tom Natsworthy – who hails from a Lower Tier of the great traction city of London—finds himself fighting for his own survival after he encounters the dangerous fugitive Hester Shaw. Two opposites, whose paths should never have crossed, forge an unlikely alliance that is destined to change the course of the future." Mortal Engines is scheduled to be released December 14th, 2018.